You’ve been with your partner for long enough to know that it is true love, and you know in your heart of hearts that the time has come to start considering proposals and engagement rings. That moment of realisation that you have found your life partner is one you will never forget. Soon, you will be ready to start a brand new life together, with a future filled with promise. What many happy couples don’t often remember however is that a large part of your future happiness lies in having minimal stress factors that could put a damper on those big plans and dreams you have as a couple. Money worries are one of the biggest stressors on any relationship especially, which is why it is so important to ensure that you start off your marriage without financial burdens. Despite the fact that diamonds are without a doubt an investment, buying diamond engagement rings that end up putting you in debt is never a good way to start the marriage. Wedding costs can put even more pressure on your budget, and, depending on how long the engagement lasts before the wedding plans begin, having two major expenses to worry about does not do much to keep stress at bay. How do you ensure that you give your loved one a ring that she will truly treasure forever, while still avoiding debt and potential financial trouble further down the line? This is the most important step of all. You will need to sit down and take a good, long look at your current finances, your projected income for the next few months, your expenses and your savings. Getting the best that you can afford is very different to spending a fortune that you will be paying off for many years to come. It is often a better idea to set aside funds and save for a while rather than rush things and take out a loan that may not be easy to pay back before the wedding. You can also start doing some basic research to get some idea of how much rings in your estimated budget would cost. A good jeweller that does custom designed rings often works out to your advantage, as you can determine what stones, band and details are available within your budget. Some guys like to surprise their beloveds with a ring, while others prefer to pop the question and then look for rings together after she says ‘yes’. While both options have their advantages, shopping together has the luxury of having all the info you need on sizing, preference and style. This way you can be 100% sure of what she wants, rather than taking a risk by doing your own investigation on her jewellery tastes. A single large stone is a lot pricier than a few small stones, but both can be equally impressive. A halo setting that has a circle of small stones ringed around a centre stone gives the illusion of size, along with plenty of sparkle. This type of ring is also a more eye-catching than solitaire rings, giving an alluring vintage look. The colour and clarity of a diamond reveal its grading, as well as its price. Very often, occlusions or changes in the clarity or colour can only be seen under magnification, and not by the naked eye. Paying extra for perfection that cannot be seen can end up costing you a lot more than you bargain for, while choosing a slightly lower grade means that you will have a ring that looks no less beautiful, but at a lower price. Look for ‘eye clean’ stones that look perfect but do not cost the earth, for the ideal balance. Platinum is a popular choice for engagement ring bands, as this type of band is durable, shiny and always flawless. It is also extremely costly. There are a number of other metals to choose from that can be equally impressive, while also costing a more reasonable amount. White gold looks much like platinum and is also durable, while some of the more unusual modern bands can include rose gold (with its pretty copper tint), yellow gold (for a bold, classic tint) and even the very rare green gold (perfect for those who like to stand out from the crowd). With a bit of planning beforehand, you can be sure that you find the perfect choice of engagement rings that symbolises your eternal love… without overspending or getting into debt. Looking for a bit of romantic inspiration for your quest to find the most perfect of engagement rings ever to be found? Taking a journey back through the ages to see the rings worn by some of our most iconic women will give you just the inspiration you need. From princesses to leading ladies, history has presented us with a number of women who stood out from the rest – especially in their beauty, poise and elegance. Whether you prefer to take a more modern approach to diamond engagement ring shopping, or you appreciate the sentiments and classic beauty of old fashioned style, these rings are every bit as memorable as the women who wore them. Married in 1947, Queen Elizabeth II of Windsor wore a simple yet exceptional three carat diamond solitaire ring, which was given to her by her husband, Prince Philip of Greece and Denmark. 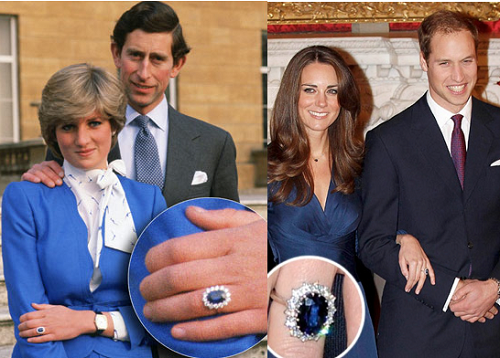 The stone in the ring was taken from the Prince’s mother’s tiara, adding even more history and tradition to its allure. The solitaire style remains one of the most popular choices for brides-to-be, offering just the right blend of timeless elegance. After a fairy tale romance, Prince Rainier III of Monaco proposed to movie starlet Grace Kelly with a Cartier eternity band dotted with diamond and rubies. During a visit to Los Angeles however, the Prince noted that large rings where worn by nearly all of Hollywood’s beauties. In order to give his love only the best, he presented her with a new ring – a 10.47 carat emerald cut ring from Cartier. 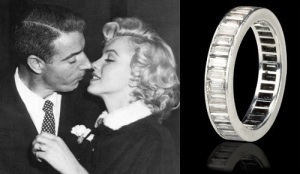 Never one to bow down to convention or conforms, Marilyn Monroe married Joe DiMaggio at San Francisco City Hall in 1954. Rather than a traditional ring, she opted to wear an unusual eternity band made in platinum and set with 35 baguette cut diamonds as a symbol of her love for her husband. 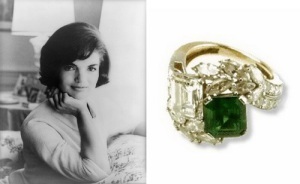 Jackie O, otherwise known as Jacqueline Onassis wore a bold ring that featured a 2.88 carat diamond set next to a 2.84 emerald cut with tapered baguettes. 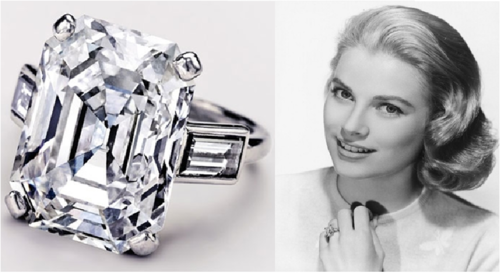 After her wedding to John F. Kennedy, her ring was later updated with 0.66 carats of round diamonds as well as 1.46 carats of marquise cut diamonds, further adding to the rings bold yet timeless design. Perfect for the woman who forged a long-lasting legacy of style and glamour. When Diana was betrothed to Prince Charles in 1984, the world was mesmerised by a Royal Wedding like no other. Her ring boasted 14 solitaire diamonds that were set around an oval 12 carat blue Ceylon sapphire, and set in an 18 carat white gold band. Decades later, the world was glued to another Royal Wedding, this time uniting Princess Diana’s oldest son with the lovely Kate Middleton. It was only fitting that Kate wore Diana’s ring – symbolising not only the young couple’s love, but also the bond that the late Diana had with her children.